Typically, a steep yield curve is a sign of a strong recovery, but there is nothing typical about current monetary policy. Here and here are two blog entries that discuss the recent steepness of the yield curve in the US. 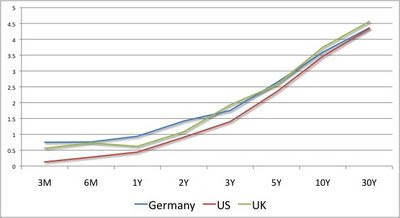 One thing that I find interesting is that despite the uncertainty surrounding the current economic situation, the yield curve is almost identical in the Euro area (Germany), the UK and the US (see chart below). This means that not only the perception of a default risk for these three government is similar, which is probably a reasonable guess, but also that inflation expectations are almost identical for the ECB, the Bank of England and the Federal Reserve. While it is difficult to imagine circumstances where the inflation rates in these three areas deviates by a large amount, it is not that unlikely to build scenarios where inflation differentials are larger than the ones implied by those yield curves. Given the uncertainty and the difficulty predicting which ones of these scenarios will prevail, the yield curve seems to be anchored by the assumption that the three central banks will adopt very similar policies and will deliver an almost identical inflation rate. That's a strong sign of confidence on these three central banks. John Taylor thinks that the Federal Reserve is to blame for the crisis because of the low interest rates in the year 2003-2005 period. "Monetary excesses were the main cause of the boom. The Fed held its target interest rate, especially in 2003-2005, well below known monetary guidelines that say what good policy should be based on historical experience. Keeping interest rates on the track that worked well in the past two decades, rather than keeping rates so low, would have prevented the boom and the bust." You can see the full article at the Wall Street Journal (Feb 9, 2009). Alan Greenspan, as you would expect, disagrees with John Taylor and claims that the central bank was doing the right thing but the problem was the disconnect between short-term interest rates and mortgage rates (which were being kept too low partly because of the increase in saving rates coming from Asia). "Given the decoupling of monetary policy from long-term mortgage rates, accelerating the path of monetary tightening that the Fed pursued in 2004-2005 could not have "prevented" the housing bubble. All things considered, I personally prefer Milton Friedman's performance appraisal of the Federal Reserve. In evaluating the period of 1987 to 2005, he wrote on this page in early 2006: "There is no other period of comparable length in which the Federal Reserve System has performed so well. It is more than a difference of degree; it approaches a difference of kind."" You can see the full article at the Wall Street Journal (March 11, 2009). Lucas Papademus, Vice President of the ECB looks forward in a recent speech (May 15, 2009) and asks what monetary policy should do in a similar future situation. He advocates for a symmetric reaction of monetary policy: not only it makes sense to lower rates when the crisis starts but central banks should also act when financial imbalances are accumulating. "In order to reduce such potentially dangerous side-effects of non-standard measures of liquidity provision and of the very low policy rates during a crisis, monetary policy would have to be sufficiently tightened during the financial boom phase. Such a policy would dampen financial market excesses through two channels. It would tend to reduce asset prices by increasing the rate at which an asset’s future income stream is discounted. Most importantly, the anticipation of such a policy response would reduce the likelihood of a speculative bubble emerging in the first place, by affecting investment behaviour and reducing the level of risk incurred by financial intermediaries in their lending." Papademus falls short of making a statement on whether interest rates were too low during the years that preceded the crisis (as Taylor argues). But his argument supports the view that standard monetary policy (i.e. via interest rates) also has a role to play in dealing with speculative bubbles in financial markets, it is not just a matter of proper regulation and supervision. No wonder why we see bubbles in financial markets. Here is an article written about 18 months ago that was justifying the low personal saving rate in the US using the argument that the standard national accounts' measure of the saving rate did not take into account the increases in wealth associated to rising asset prices. The article was written in September 2007 right before the crisis started. It was written by David Malpass, who was at that point chief global economist for Bear Sterns. That increase in wealth is gone (and so is Bear Stearns). The decade of the 80s was characterized by a continuous increase in the number of hours worked in the US. It was a combination of an increase in the number of individuals who were part of the labor force and an increase in the average number of hours worked by a typical worker. This increase in number of hours represented a break in the historical trend were productivity gains led to an decrease in the number of average hours worked in favor of additional leisure. This trend led to the label of "overworked Americans" for US workers. It did not help that the Europeans were following the opposite trend by accelerating the historical trend of decreasing hours per worker (as in the 35-hour week in France) and by increasingly generous early retirement programs, which were a political response to the high unemployment rates of previous decades. This divergent trend between the US and European economies continued during the 90s. This was a decade where the US outperformed Europe in terms of GDP growth. While some of this was due to larger increases in productivity (the "new economy"), the majority of it was due to an increase in the employment to population ratio as seen in the chart below. The story has changed since the end of the 90s. The Europeans realized that there was a need to reverse the trend of recent years, which led to labor market reforms and increases in employment. The US labor market suffered large employment losses during the 2001 recession and the recovery that followed was unusual in terms of low employment growth. And before the employment to population ratio could reach the pre-recession level, the current recession started. The US is now at a level which is below the one in 1992. The Euro economies did not suffer much through the 2002/03 crisis and so far the fall in employment in the current crisis has not been as dramatic as in the US. There is no easy explanation for why the US labor market has not performed better since the end of the 90s. 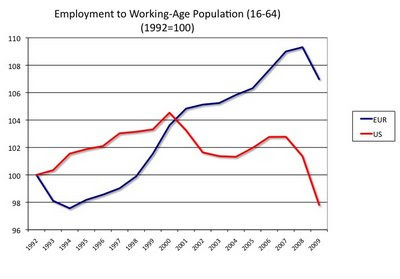 It is true that it had reached a level of employment from where it was difficult to continue growing so maybe there was some truth to the expression "overworked America" (be careful reading the chart above as both series are normalized to 100 in 1992, the employment to population ratio in the US remains substantially higher than in Euro countries). Going forward, it is possible that we see employment growing fast again in the US. With the large destruction of wealth in the US because of the collapse of housing and stock prices, the only way to keep up with the previous living standards is by working longer hours and having more than one income in every household. And those who had planned to retire soon, might be required to work some extra years to compensate for the loss of their pension plans. The results from the Stress Tests were released yesterday and there were very few surprises. The numbers matched the predictions (which were coming from leaks), the reaction of stock markets were positive and the reaction of many commentators was very critical, because of the methodology and what some see as an attempt to avoid difficult political decisions by hoping that an economic recovery helps banks get out of trouble. There is no doubt that a healthy financial system is key for a strong economic recovery. There is also little doubt that many banks will still see large amount of losses in some of the assets they hold (although there are disagreements about the exact amount). And it also seems clear that the amount of expected losses might be larger than the capital that banks hold today, thus the need for some of them to raise additional capital. The FT reports in today's edition that banks negotiated with regulators to reduce the amount of equity that would be required after the stress test (the Wall Street Journal run a similar story yesterday). One of the arguments the banks used is that they would be able to generate some of this capital by earning profits over the coming quarters. How realistic this is? If some of these banks are 'zombies' (technically insolvent), how will they generate profits? Wasn't this the purpose of the stress tests, to identify these banks now, make sure that their balance sheet is healthy rather than letting them stick around hoping that the economy improves? But if the banks are not healthy and cannot lend, how can the economy improve? An interesting argument is made by James Surowiecki, citing research from Joe Peek and Eric Rosengreen. When looking at the Japanese experience, the slow recovery was not only due to the presence of 'zombie banks' but also to the presence of 'zombie corporations' which were supported by these banks. In fact, a lot of the credit given by Japanese banks to companies was given to companies who could not repay their previous debts (by keeping these companies alive the banks did not need to record the losses). According to Peek and Rosengreen, the government and regulators also encouraged banks to give credit to those companies. If banks had better allocated their credit, we would have seen the necessary renewal at the corporate level and an earlier exit from the recession. How do we know that banks in the US and other advanced economies will not engage in the same behavior than banks in Japan in the decade of the 90s? If you want to be optimistic you might argue that the strong ties between Japanese banks and corporations and are not present in advanced economies (although one can easily argue that this might not apply to all countries). You can also be hopeful that governments do not put too much pressure on banks to lend without the proper lending standards (although we have already seen enormous pressure on banks to lend). Finally, you can also hope that the banks are not given incentives to create short-term profits at the expense of their long-term survival (although it might be that the november deadline for US banks to raise the needed equity could indeed provide the wrong short-term incentives). And if all this is not enough to make you feel optimistic, you can always start a cartoon series about zombie banks (see the video below). The Stress Tests Results for the largest U.S. banks will be released today at 5pm (ET, US). While the results were supposed to remain confidential until this afternoon, there have been a good number of leaks regarding the needs of each of the individual banks. The blog Calculated Risk has posted a table with estimates of the capital needs of each of the banks. While the numbers are large for some of the banks (Bank of America tops the list with 34 billion), it seems that a combination of raising capital in private markets and public funding might provide the necessary additional capital. However, uncertainty will remain even after the results are presented this afternoon. Some will question the methodology (Are we really looking at the worst case scenario? How were the legacy assets valued?) but the debate is likely to be around how some of the banks in need of capital will raise new funds. The government would like to avoid providing new funds. One quick solution is to convert previous public funds into common stock. This solution has been criticized by Paul Krugman on the grounds that is simply an accounting trick (although it all depends on the methodology that the stress tests used, more this afternoon). In addition, such a conversion is moving us in a direction of slow partial nationalization, with the problems that Nouriel Roubini highlights in this FT article. On the other side of the Atlantic, the ECB has decided to cut its interest rate to 1% and start purchasing Euro-denominated covered bonds. Not a big surprise. Here is the press release. 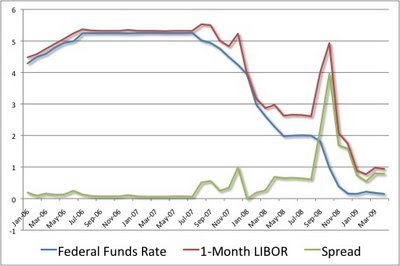 Back in the Fall of 2008 the spreads between standard interbank lending rates (such as LIBOR) and central bank interest rates made the headlines of all major newspapers because their levels were at record highs (even compared to times of crises). Slowly but consistently, these rates have come down and are at now at levels which are the lowest historical level since those markets exist (as reported by the Financial Times today). The spread relative to central bank interest rates remains above what could be considered normal but very far from what we saw back in November 2008. A signal that financial markets are slowly returning to normality. Of course, uncertainty still remains - including the outcome of the stress tests on US financial institutions that will be released this week.